Have you ever wondered if everyone likes the same candy as you? Or, even what people prefer in other states during Halloween? It’s not really something that most people think of but it is quite interesting to know. 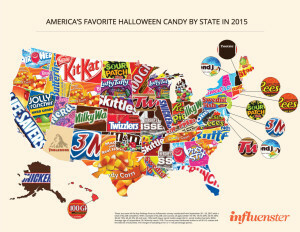 Exactly what is the favorite Halloween Candy in each state? According to House Beautiful Magazine most states in the United States love candy corn and although candy corn is the all time favorite of most other Halloween candy’s are not far behind. For example, Florida loves Nestle’s Crunch Bars and California likes Life Savers. Louisiana likes Swedish Fish and Texas likes Candy Corn the best! Sure that thinking about this is not high on the list of things you just ponder but fun Halloween facts to know. Halloween candy has been around for many years and pretty sure it always will be!